One of the major problems with fossils is that scientists cannot get a complete concept of the critter under scrutiny, especially if it is rather complex. There are about a dozen Archaeopteryx fossils, some of which are good. It was considered a transitional form between birds and dinosaurs. When that was discredited, other speculations were presented. How about comparing Archaeopteryx with a similar living bird, the Hoatzin? Seems to me that the hoatzin is the platypus of the bird world. In both cases, our Creator seems to be having some fun with us and with devotees of baryon-to-bird evolution. There are very few decent fossils of the hoatzin, but those that do exist do not show any kind of evolution. Better yet, we can see the peculiarities and characteristics of this bird that defy evolution and affirm special creation. These include claws on the wings that only last for a short time in the young 'uns, problems in classification, vegetarian, digestion and microbial colonies, and more. Evolutionists love to talk about how dinosaurs evolved into birds. Their favorite example is undoubtedly Archaeopteryx, which they believe is either one of, or the first transitional forms between dinosaurs and birds. In making this argument, they point to Archaeopteryx’s combination of feathers, wings, and claws on the wing, among other traits, which they claim are indicative of a creature evolving from a reptile into a bird. Yet there is a living bird which displays all of these features, at least as a chick and fledgling. That bird is the South American rainforest denizen, the hoatzin. 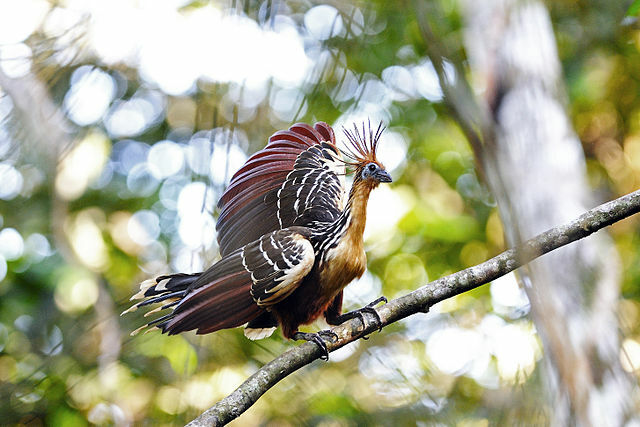 The hoatzin provides evidence that Archaeopteryx is not a transitional form after all. To read the rest, click on "Hoatzin Bird: Evidence Against Evolutionary Ideas".